American Lock’s solid steel round, heavy-duty, hidden shackle padlocks are the toughest padlocks of their type ever offered to those who are serious about security. With rekeyable six-pin tumbler cylinders and tens of thousands of key changes, these padlocks offer maximum protection against drilling, sawing, prying, crowbars, dent pullers and hammers — so they’re ideal for protecting high security areas and are adaptable for applications on garages, storage buildings, vehicles, commercial buildings, industrial plants and vending machines. Note: The three flat back locks, models A2500, A2010 and A2001, are tapped and threaded to allow for attachment to either high security hasp A801 or A802. Your best choice for security: bundle packs, which combine the lock with high security hasps for greater convenience and physical security. Bundle packs include A2500LHC1, A800LHC, A801LHC and A802LHC, with specifications listed below. 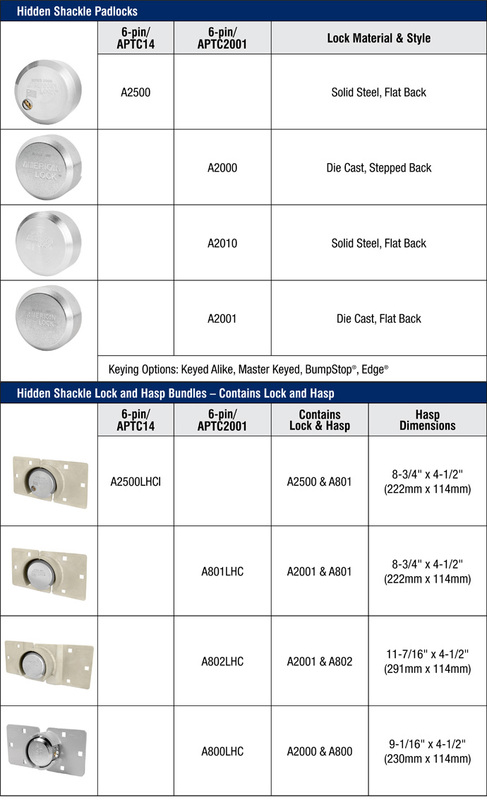 Rekeyable hidden shackle padlocks include A2500, A2010, A2001 and A2000, with specifications listed below.